Less than half price! 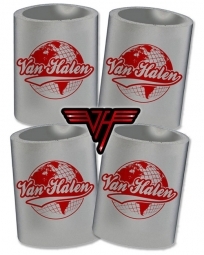 Save $9 on a pair of Van Halen Can Coolers. Keep your beer or soda ice cold in these VH Coolers. Grab a few for your next party, or give as gifts to your beer drinkin' buddies! 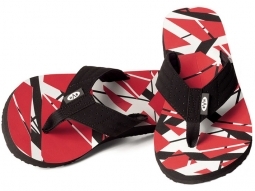 They're thick, durable, and feature the red Van Halen logo on both sides. Provides us snug fit around cans. As good as the Koozie brand. Also called can coastie, cozy, coosie, hugger, or huggie. Officially licensed. Out of production and limited supply. These are nice and thick, and keep cans of soda and beer cold. Way better than the cheap, folding ones most places sell. I wish they made them for beer bottles, too. A bottled beer will fit, but it won't be as snug. For cans, it's a tight fit. They're comfy to hold, too. Nice and soft. And the printing is really crisp. You can clean them with a damp cloth or just water.